Tucked into the corner of Prince William Sound, College Fjord is surrounded by over a dozen glaciers and is easily the equal of the more famous Glacier Bay. Some of these glaciers have spruce forests growing right up to the edge of the ice, giving a sense of scale not seen in Glacier Bay. The fjord was named in 1898 by an expedition team that opted to give the glaciers lining College Fjord and their neighbor, Harriman Glacier, the names of Ivy League and other prominent Eastern universities – hence, Harvard, Vassar, Williams, Yale, and so on. 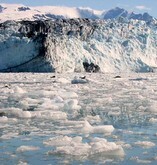 In recent months, cruise passengers have come within 1,000 feet of Harvard Glacier, and found that it is calving (i.e. losing material) every few minutes. This process offers visitors an unforgettable sight to behold, but also is a sad reminder of how quickly something that seems so permanent can disappear. You can get an up close and personal look at College Fjord aboard Holland America’s Statendam. The 7-night cruise begins in Vancouver, British Columbia and follows the Inner Passage to Seward, Alaska. It is a wonderful way to see the Last Frontier and its splendid glory, the College Fjord. Priceline Cruises: 23 U.S. Ports, 135 ships, 17 Cruise lines!